Available on weekly or longer terms. 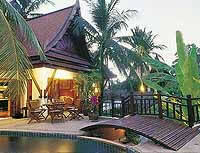 Baan Sabai literally means “Relaxation House” in Thai. Set amongst tropical gardens and waterfalls with views across Patong Bay, Baan Sabai comprises over 1700 sq.m. of land, with over 600 sq.m. of living space and a further 600 sq.m. of terraces and poolside area, giving you the space and environment to feel exactly that - relaxed. Bounded by 10 foot granite rock walls and remote control security gates, privacy and security are assured during your stay. Located on the hillside just south of Patong, Baan Sabai offers the peace and tranquility of a resort, yet is only minutes by car to the beaches and heart of Patong. Villa Neela is a available for exclusive short term holiday rental. The villa sits at 50 meters above sea level, on 1400 sq. 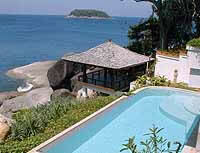 meters of land, commanding stunning views of the Andaman sea, the Amanpuri Hotel headland and Bang Tao bay. Surin beach is literally at the foot of the hill. There are 300 sq. meters of rooms, extensive balconies, a large pool area and lushly planted gardens and ponds. Neela’s features include four double bedrooms, two with Jacuzzi baths, an elegant living/dining room, a conservatory and a dining sala with breathtaking views. Available on weekly or short terms. This ocean front villa is one of the premier private villas in Phuket. It occupies the point of the headland and faces directly west to the sunset and northwest overlooking Kamala bay and the Amanpuri hotel. The villa comprises 6 bedrooms, spacious dining and living pavilions both inside and outside. 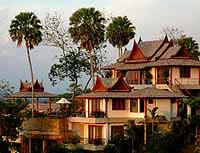 The property is well furnished in Thai style and comes with it’s own staff. Guests will enjoy walking access to a very private beach area with complete with the estates own private beach pavilion. Laem Son Villa3 is situated on an impressive rock face looking directly out to the West over the amazing crystal clear waters of the Andaman Sea. 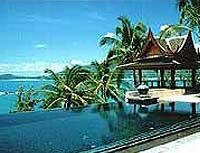 This ocean front villa for rent is within one of the premier private villa estates in Phuket. The Villa has been designed to lodge four families, with children, in the comfort of expansive living areas and an impressive 42.6 Square meter pool.It occupies the point of the headland and faces directly west to the sunset and northwest overlooking Kamala bay and Amanpuri hotel. Laem Son Villa3 is just 10 minutes from Patong, 15 minutes from Laguna and 30 minutes from Phuket International Airport. An expansive Thai style villa designed for luxury getaways. Eight bedrooms, six with king size beds and en suite bathrooms. Central pool with plenty of terrace area to relax/entertain. State of the art entertainment system. Staffed to accommodate your every need. Within minutes walking of Bang Tao beach.